This wonderful pink and brown cake was decorated to match the cute Monkey artwork on the invitation. 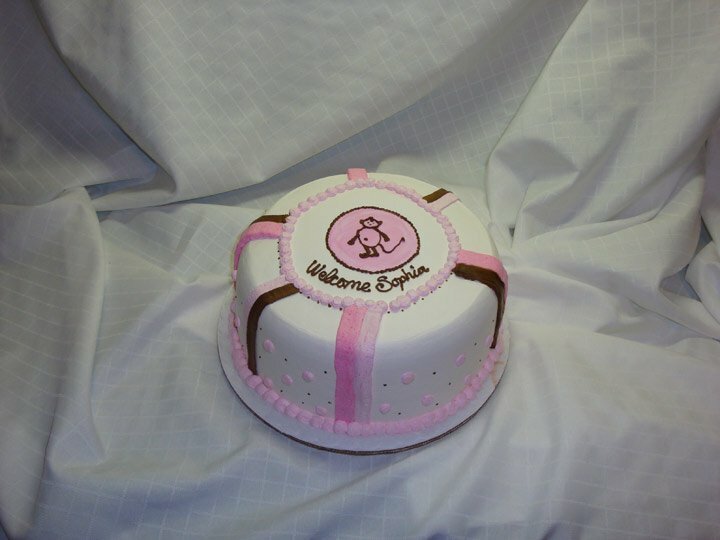 Baked with delicious white cake flavor, this Baby Shower cake served a 30 person party in Yorba Linda, CA. Call us today to work with your Baby Shower ideas or to match your decorations or center piece. 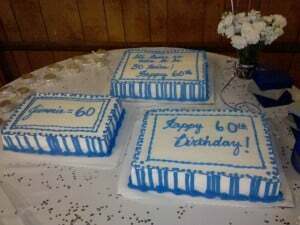 We delivered 3 beautiful white with blue accent sheet cakes for Jimmie’s 60th Birthday. It was held at the Assistance League of Anaheim building in Anaheim, CA. The quote on the cake says “It’s twice as nice being to be 30 twice, happy 60th!